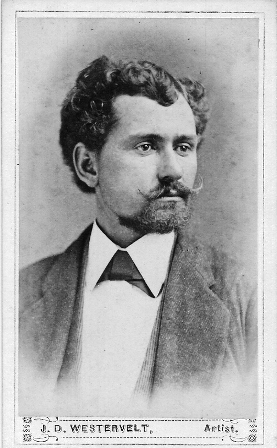 Ezra Kauffman was born November 1, 1849 in Logan County, Ohio. He died December 5, 1920 at the age of 71 in Denver after an amputation of the leg which had never healed after a blow from a mining hammer in his youth. Ezra’s mother died when he was 4 months old. He then lived with his father’s parents in McLain County, Illinois. His brother, Rufus, however, went to the maternal grandparents in Mifflin County, Pennsylvania near Milroy. When Ezra was sixteen, he went back to his father who had by then, 1867, made a second marriage. They were in Shelby County, Illinois. Stepmother died. After his father married a third time, Ezra went off on his own. When Ezra’s father and Rufus came to Greeley with the colony, Ezra was not with them. He had become a cowboy in Nebraska. He happened to run into them once when he was in Greeley, but he went back to being a cowboy. He at one time owned a sheep ranch near Fort Collins. He left the ranch after the sheep died, then he went to Lulu City. He hunted and fished in the mountains and guided others from time to time. 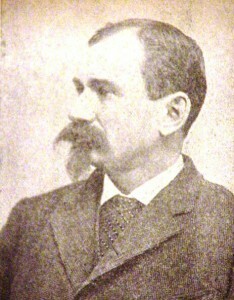 He was in the Grand Lake region in 1877. He “packed” miners “in” to Lulu City in 1879. Then he settled at Hot Sulphur Springs where he had a saloon. From time to time he prospected in various places; but a place up the Willow Creek Valley must have seen him more often for a tributary of Willow Creek is called Kauffman Creek. He married Clara Johnson on October 13, 1888. Mary and Carl were born in Hot Sulphur Springs: Henry Carlton Kauffman on July 18, 1890, and Mary on July 3, 1889. Ezra and Jim Ganson had a saloon; but Ezra was a silent partner. He sold the saloon and lived at the Grand Lake House while building the Kauffman House. Jim Elliot did some of the building, or all. The Kauffmans moved into the house in the spring of 1892. Carl was eight years old when his mother went to Golden. The divorce was in 1899. Ezra Kauffman married Belle Stowell, October 22, 1907. Ruth, Rosemary and Margaret were born. Ezra ran the hotel between marriages with the help of Mrs. Adams one year (and that register is preserved at the museum, given by her granddaughter Mrs. Gemmil) and one or two years with the help of Annie Harbison. Ezra always had trap lines in the winter up the North Inlet and the East Inlet and on Cornstalk Mountain. He would often be gone two or three days at a time. He had small cabins about a day apart to stay in. He was always sure to go out for huckleberries late in the summer, too. He and Ruth and Rosemary went huckleberrying on Cornstalk mountain the fall before he died. They wrote it up several years ago.